But if an abuser tries to extract the pseudoephedrine out of Nexafed to make meth, it breaks down into a thick gel that thwarts production. That’s all thanks to a technology developed by Illinois-based Acura Pharmaceuticals. Vice President of Marketing for Acura Brad Rivet said the product, which has been on the market since last December, is comparable to similar, more familiar drugs you may already have in your medicine cabinet. “We’ve done a comparative study with the branded pseudoephedrine product to show that, in humans, the rate and extent of absorption in the bloodstream is virtually identical. So, the efficacy that people have come to expect with older drugs that don’t have this technology will be there for them with Nexafed,” said Rivet. Fruth pharmacies will continue to stock other pseudoephedrine products that offer different dosages from Nexafed. The company plans to replace traditional pseudoephedrine products with the new drug as more dosages become available. Lynne Fruth, president of the company that bears her name, admits the pharmacy may take a hit to its bottom line because of brand loyalty and those still managing to use pseudoephedrine for illicit purposes. However, she says it’s important the company plays a role in protecting the community. “If they’re looking for the purposes of meth, they aren’t interested in buying this product. We’re having pharmacists tell us that when they say, ‘We don’t carry straight Sudafed except in the Nexafed’ then some people say ‘Well, I don’t want that stuff.’ Which, that tells us that’s probably not a legitimate purchaser of the drug,” said Fruth, who also chairs the board of her Point Pleasant-based company. In West Virginia, 288 meth labs were seized last year. So far in 2013, authorities have seized over 300 meth labs, most of which were discovered in Kanawha County. In mid-May, The Charleston Gazette reported state police estimated that meth lab seizures for 2013 were on pace to double last year's numbers. Congresswoman Shelley Moore Capito attended Fruth’s Nexafed roll-out announcement at the Lee Street location in Charleston. She suggested legislation that might curb meth production by requiring a prescription to purchase pseudoephedrine could be considered at the state level. 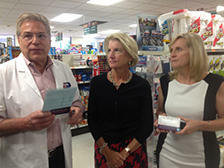 Lee Street Fruth Pharmacist Sam Arco explains the new product Nexafed as Congresswoman Shelley Moore Capito and Lynne Fruth, president of the company, look on. The product contains pseudoephedrine but cannot be used in the manufacturing of methamphetamine. “I think that’s something that’s been considered in the state and I think that’s something that, if the problem continues without a solution—or attempted solutions like the ones we’re seeing—I think that’s probably something that would be considered,” said Capito regarding a prescription requirement for the drug. Currently only two states, Oregon and Mississippi, require a prescription for the purchase of products containing pseudoephedrine. In an op-ed from 2010 published in The New York Times, one law enforcement official from Oregon has said that tactic is translating to fewer meth lab busts. “The monitoring method doesn’t really take care of everything because I can buy a box, Congresswoman Capito can buy a box and Lynne can buy a box. All of the sudden we have three boxes out there. We don’t know where it’s going. You just don’t know that all of the time,” Arco explained, hypothetically. Even despite the use of the National Precursor Log Exchange tracking system, known as NPLEx, West Virginians are still purchasing traditional, potentially meth-yielding pseudoephedrine products at a rapid pace. About 40,000 boxes per month of the sinus medication have been sold so far this year, according to data from the state pharmacy board. Such high sales and skyrocketing lab busts brought Del. Don Purdue (D-Wayne) to ask Attorney General Patrick Morrisey to investigate manufacturers of pseudoephedrine. The Beckley Register-Herald recently reported that Purdue intends to revisit a bill that would require a prescription for the drug. Are smaller, independent pharmacies the key to curbing meth production? Fruth said past the monitoring system and any legislation on the books, the ultimate decision lies in the hands of those working behind the counter. “It is totally at the pharmacist’s professional discretion to decide if they’re going to sell pseudoephedrine. One of the things as a local family-owned company, you tend to know your customers and a lot of our pharmacists will often opt if it is somebody from out of state or a customer who is not known to them,” said Fruth. Rivet said Acura has intentionally targeted smaller pharmacies around the country like Fruth because of their heightened ability to influence consumers. “We started with independent pharmacies because the pharmacist at that level is obviously aware of the need in his community and they see the need for a product like Nexafed,” said Rivet. Rivet said Nexafed is currently available in over 1,400 pharmacies nationwide.